Share your #HealthySelfie. Follow three simple steps for a chance to win $500 for GABCC! As the holiday season approaches and it’s time to consider what we have been grateful for in 2017, #GivingTuesday is a great time to start thinking of ways to give back our communities and the causes we care about. 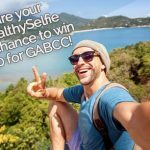 This November 28, join us for #GivingTuesday and help GABCC win $500 for getting supporters to post their #healthyselfie and selecting GABCC charity, should when you win. You can also learn about six ways to give in addition to the contest.